Its fall and time for some great recipes for our winter squashes. This dish is so simple and quick to prepare you can have dinner on the table in less than thirty minutes. You could use this in several different applications… add some bowtie pasta a bit of olive oil and toss. Maybe puree the squash with some vegetable or chicken broth then add your kale… soup! It’s beautiful, healthy and delicious. I think you are going to love it, Kenny and I sure do. 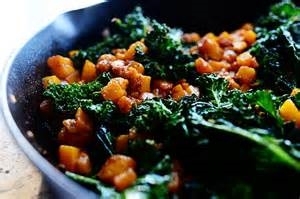 In the same skillet, melt 1 tablespoon of butter over medium-high heat and add in the kale. Toss it around with tongs and cook it for 3 to 4 minutes. Add in the cooked squash and gently toss together. Sprinkle goat cheese on top before serving. Serve as a main veggie dish, or side dish with chicken or beef.